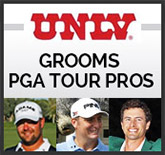 Philip Rowe was hired as an assistant coach for the UNLV men’s golf program in August of 2014. He is in his first season in Las Vegas. Before coming to UNLV, he spent four years as assistant coach for the men’s golf program at Stanford, his alma mater. A four-year letter-winner for the Cardinal from 1999-2002, Rowe came back to Stanford after eight years of competing on various world tours, including a five-year stint playing on the professional circuit in France. Rowe won four world-wide tournaments as a professional, including a pair at the Open de La Réunion, and was ranked ninth by the Allianz Golf Tour in 2009. Since 2005, Rowe has been the attached touring professional golfer for the Trevose Golf & Country Club near Padstow, Cornwall (England). He was a two-time Academic All-American at Stanford and captained the team as a senior. He posted team-low scoring averages of 72.8 (2001) and 71.8 (2002). Rowe captured the 2002 U.S. Intercollegiate Championship held at Stanford and earned honorable mention All-America honors as a senior. 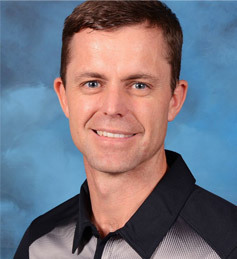 A native of Cornwall, England, Rowe played for the England Boys Team at age 16, and competed with the Great Britain & Ireland Boys Team in 1996 and 1997. He accumulated 30 team match representations (caps) for the England Men’s Team. In 1999, Rowe teamed with future PGA stars Luke Donald and Paul Casey on the victorious Great Britain & Ireland Walker Cup team that defeated the United States at the Nairn Golf Club in Scotland. Rowe won all three of his matches to help secure the team win. Rowe was also a four-time Palmer Cup team member highlighted in 2000 when he led Great Britain & Ireland to victory by sinking the deciding putt on the 18th hole. He also competed in the 2000 British Open at the Old Course in St. Andrews, Scotland. As an assistant coach at Stanford, he helped lead the team to a NCAA Final Four (national semifinals) finish last season (2014) and the team boasted the individual national champion (Cameron Wilson) in addition to the national player of the year (Patrick Rodgers). That Cardinal squad recorded seven team victories (in just 12 total events) for a winning percentage of .583, while Rodgers and Wilson combined to win an incredible nine individual tournament titles. Stanford’s team and individual championship increased each year during Rowe’s time as an assistant coach and he helped lead eight student-athletes to All-American honors and eight achieved All-American Scholars status.He has also served as Europe’s Palmer Cup Team Assistant Coach each of the last two years – 2013 at Wilmington Country Club in Del., and 2014 at Walton Heath in London. He assisted his 2014 squad to an 18.5-11.5 victory over the United States. Rowe earned a degree in psychology from Stanford in 2002. He is married to Claire and they have two children – a son: Paul (3); and a daughter: Iris (1). He replaced JC Deacon on staff at UNLV, who was the program’s assistant coach for the last four years. Deacon left the Rebel program to become head coach at Florida.